I saw this picture a few days ago and it made my heart ache. They say this is a seven year old boy, somewhere in Aleppo. 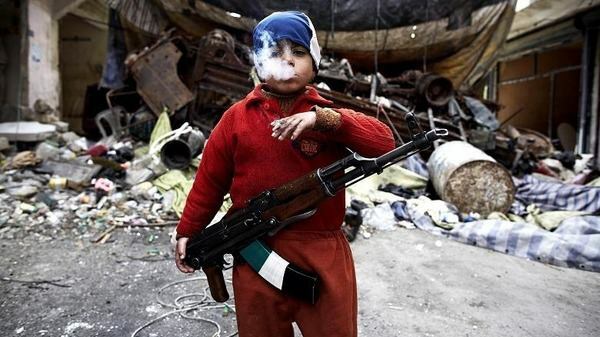 He holds his cigarette like a pro and carries the machine gun non-chalantly. Nobody should be under any illusion about how sad this state of affairs is. It is a tragedy when a boy this small, who probably doesn't even know how to read, thinks that he is a fighter of some sort. He's seen almost nothing but strife in his short life. How will a child like this grow to be a man? To love a woman or to raise children of his own? How will he learn the joys of being patient and reaping the fruits of his labour, or of learning from his own mistakes? Will he even live long enough to grow his first stubble? There is only one thing which is certain about this picture to me. The regime wants Syrians to despair and understand one message. It is a message that is both simple and devastating, "There is no past and no future for Syria without Assad."